The new Cat 798 AC off road truck hauls a 372-tonne payload at Caterpillar’s test track in Arizona. PEORIA, Ill. – With the introduction of the new Cat 798 AC and the 796 AC, Caterpillar expands its mining truck line to give customers the flexibility to choose what meets their needs and preferences. The new electric drive 798 AC features a 372-tonne payload and joins the proven mechanical-drive Cat 797F in the 400-short-ton size class. The new electric drive 796 AC delivers 326-tonne payload and will replace the Cat 795 AC in regions where engine emissions are highly regulated. Both trucks will be available in second quarter 2019. The AC power train of each of the two new trucks draws from the Cat 795 AC and Cat 794 AC, which have been operating successfully for about 5 million hours. Cat AC electric drive is developed and manufactured by Caterpillar, the single source for the entire powertrain. The Cat C175-16 diesel engine powers both of the new trucks. With more than 21 million hours of operation in mobile equipment and power generation, the reliable engine can be configured to meet U.S. EPA Tier 4 emissions regulations and offers a choice of 2,610 kW or 2,312 kW to meet the mine’s needs. To further adapt to the mine, simple software changes can adjust system power to help meet production targets or to work smoothly in mixed fleets. The 796 AC and 798 AC are built for efficient production. Both truck models are designed to minimize empty machine weight, as configured in the field. The design enables the 798 AC to carry its class-leading payload of 372 tonnes and to haul more material each cycle on 59/80R63 tires. The new trucks feature four-corner, oil cooled disc brakes as well as dynamic braking for stable handling and fast stopping. Superior retarding capability, blended braking and the Cat traction control system help boost productivity while enhancing safety. The Cat AC drive is a high voltage system (2,600 volts) that operates at lower current than most competitors’ systems. When combined with full integration of the power train, the result is lower heat generation, smaller and lighter components, and longer component life. 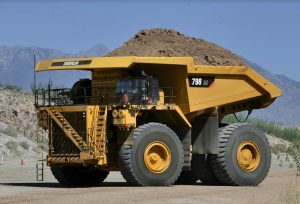 For more information about Cat mining trucks, contact the regional Cat dealer or go to www.Cat.com/mining.